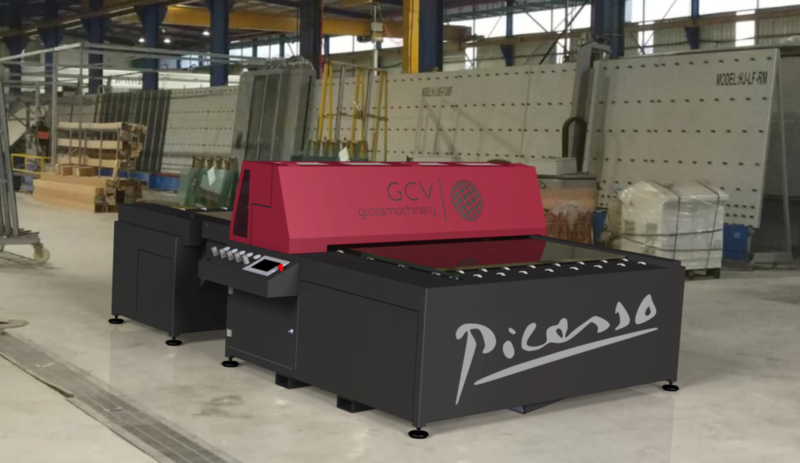 Our machine is the result of the influence of Pablo Picasso and more than 20 years of experience applying our resins manually.The Picasso involves a new spraying fashion: automatic, clean, environmentally friendly and handy. It avoids useless elements, implements systems and improves shortcomings of competitors assembling the best parts in the market. 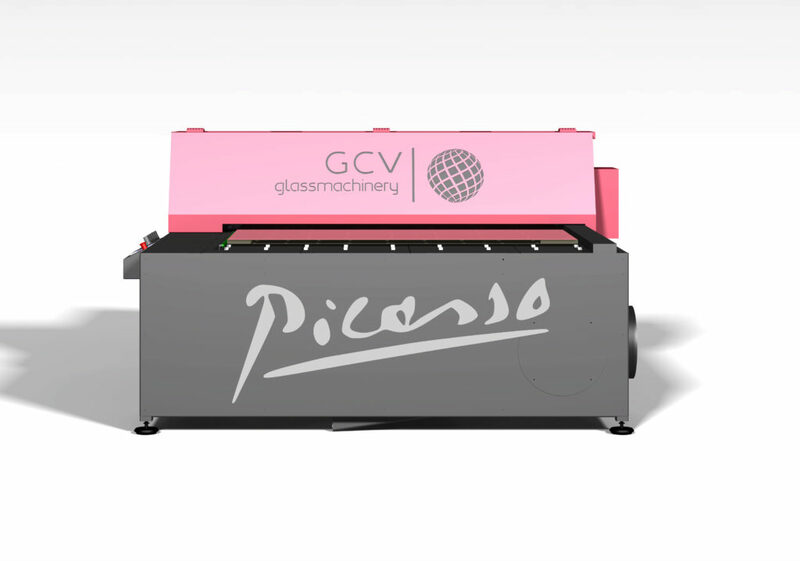 There are painted glasses and machines like this already installed in such dissimilar and demanding markets as Mexico, USA, Germany, Poland, Sweden, Spain… Picasso turned out to be the favourite machine of the glass makers both for companies completing its glass painting section and for total beginners. 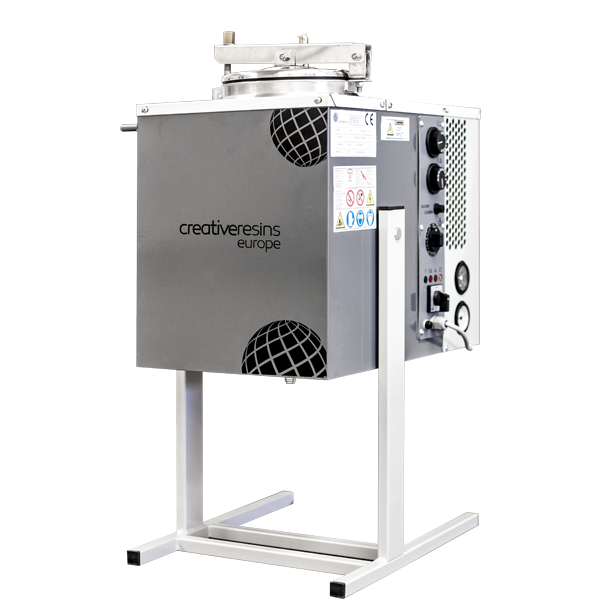 Creative Resins Europe is the sole company in the world manufacturing glass paint and the application equipment, which avoids the most common troubles found in this kind of machines such as product incompatibility. This offers reliable quick troubleshooting and expert technical support for any matter through one single guarantee commitment. One single supplier avoids all possible problems caused by processes. Picasso means a target for evolution and full equipment with respect to other spraying machines in the market. Designed by glass makers for glass makers. 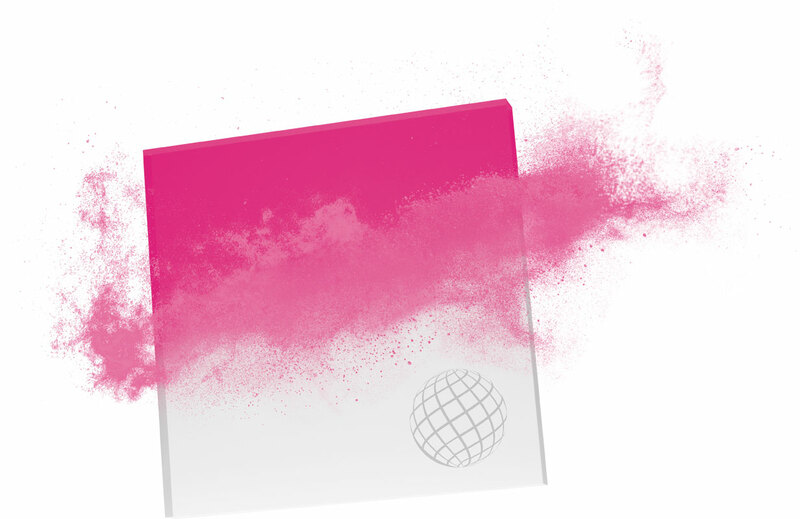 Colour can be fully changed in 3 minutes , even for cold process paints or ceramic inks. Operator will be able to clean the spray gun automatically at any time, even with paint ready to be used, avoiding common problems such as jammed needle, dirt and dry remaining, or paint leakage. No sedimentation problems, no product hardening in the tank, no jammed pipes, while paint surplus can be recovered in perfect condition after job is finished. The resins can be kept in the machine for more than 8 hours without jamming pipes. 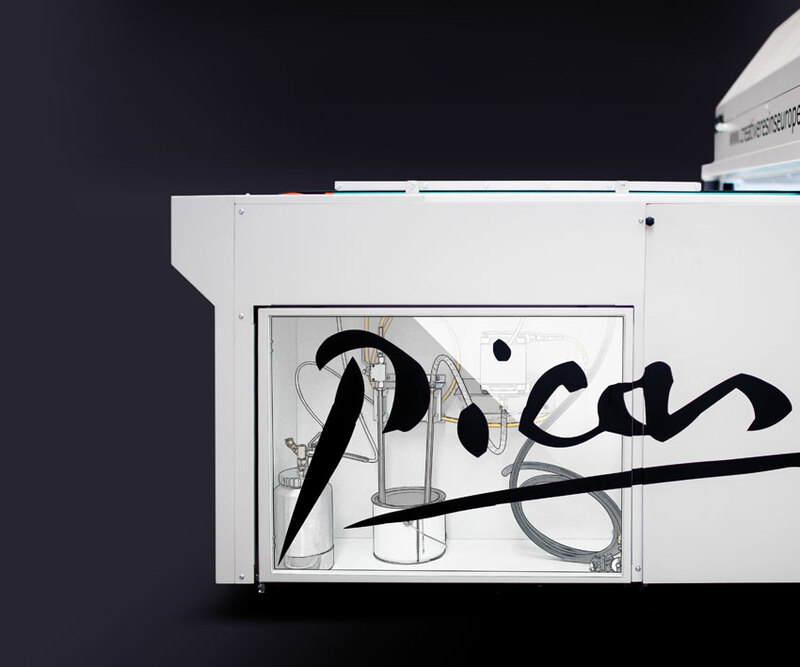 Picasso adapts better to variable paint quantities and tank kinds as different tin sizes can be used (0.5Lt; 1Lt; 2.5Lt; 5Lt; 10Lt…) and they can be refilled at any time while the machine is just painting. It does not have to stop to add more paint or change hermetic tanks. 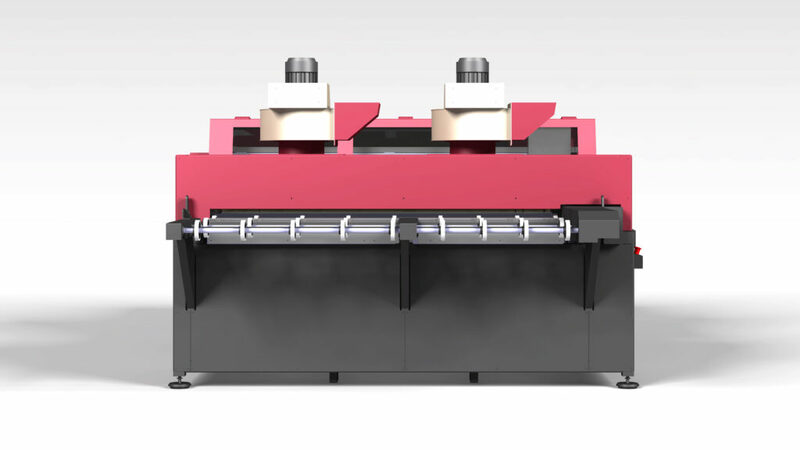 An upper model of the Japanese brand ANEST IWATA is equipped on the machine head cart. 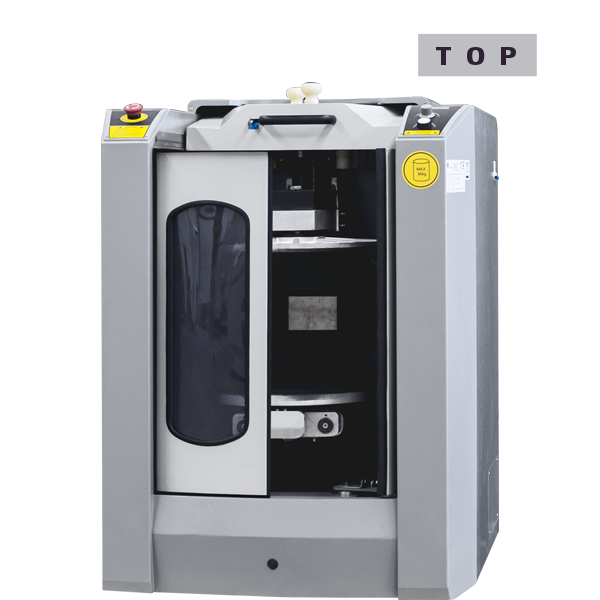 It can be dismantled in 10 seconds for easy and safe maintenance and cleaning. Glass is detected by sensors to measure both length and width automatically. The Ultrasonic sensors are protected by anti-dust air chamber to keep them clean. 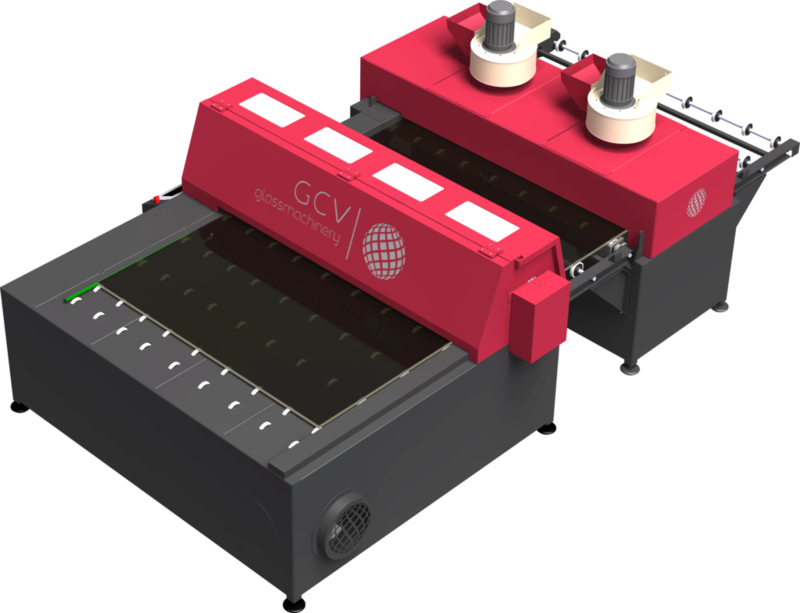 Unlike laser sensors, they do not have to be cleaned periodically. This powerful air extraction system allows paint dust particles filtering and volatile solvents absorption to get clean air taken to the facilities. Painting chamber is sealed by air curtains in the intake entry and the outlet exit, so the air chamber is forced to go through a three step filtering system including active carbon filters. 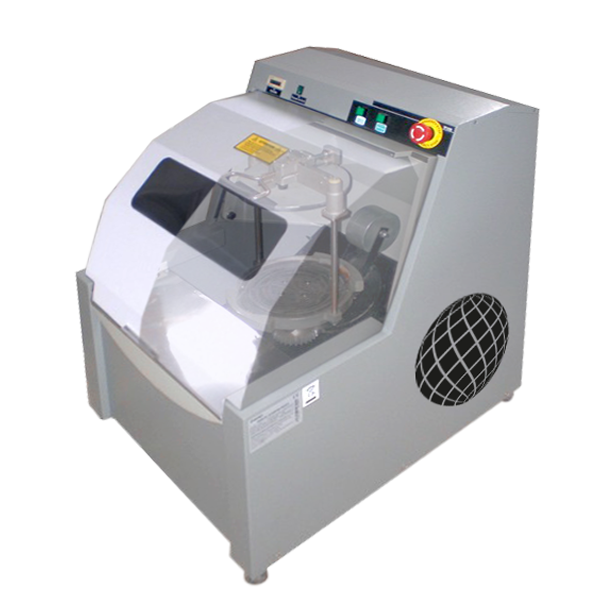 It can be adjusted even while working, optimizing time and avoiding stops which additionally mean opening the painting chamber and releasing solvents as well as letting the dust come in it. 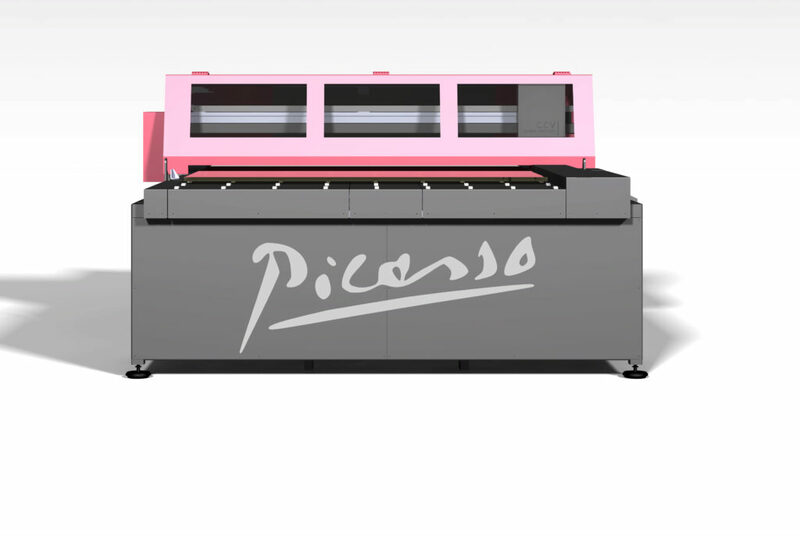 Technical Support department can connect the Picasso machine through the internet for software update, maintenance or troubleshooting. 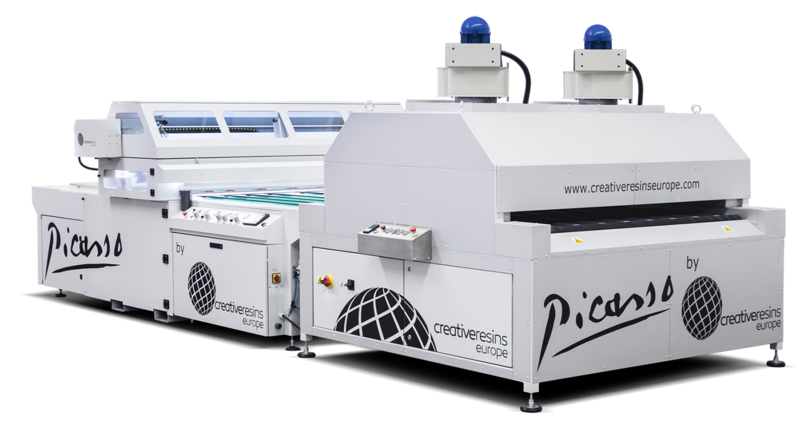 Picasso production is flexible and profitable from 2 square metres on, while it can reach 80 square metres per hour. Is a painting line profitable? Of course. Painting glass is one of the most lucrative activities nowadays. Process cost versus retail price turns out that the paint is an added value appreciated by buyers. What do I need to start painting glass? Just the necessary equipment. Creative Resins Europe will advise you to get the best choice for your company. 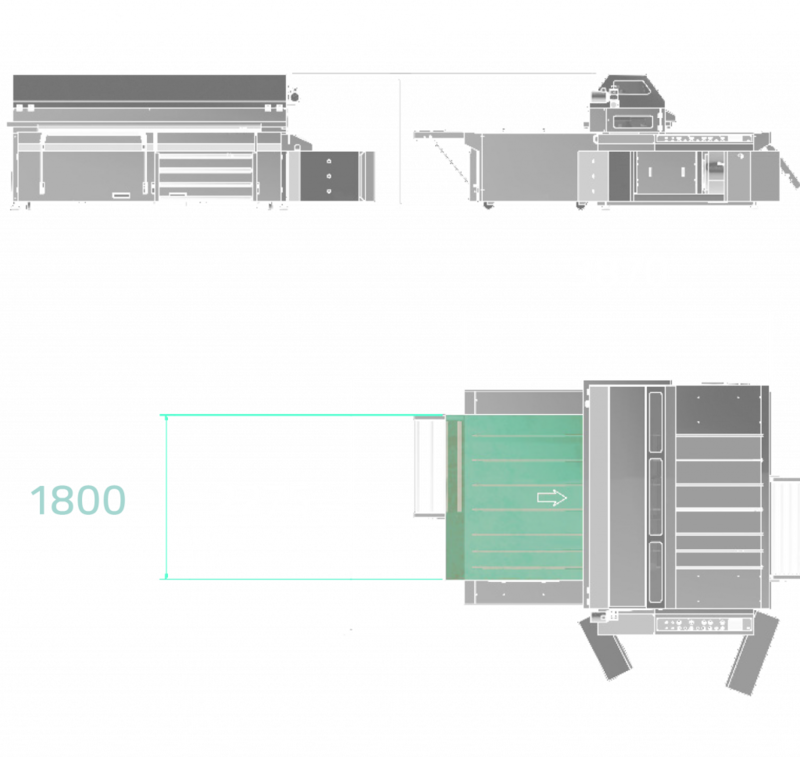 From the lowest cost manual system to the top painting line, our technicians will support you to get perfect production from the very first day. I have got a roll painting line already, why should I need a Picasso? Roll painting lines are incompatible with two part paints, which is a drawback for some works. 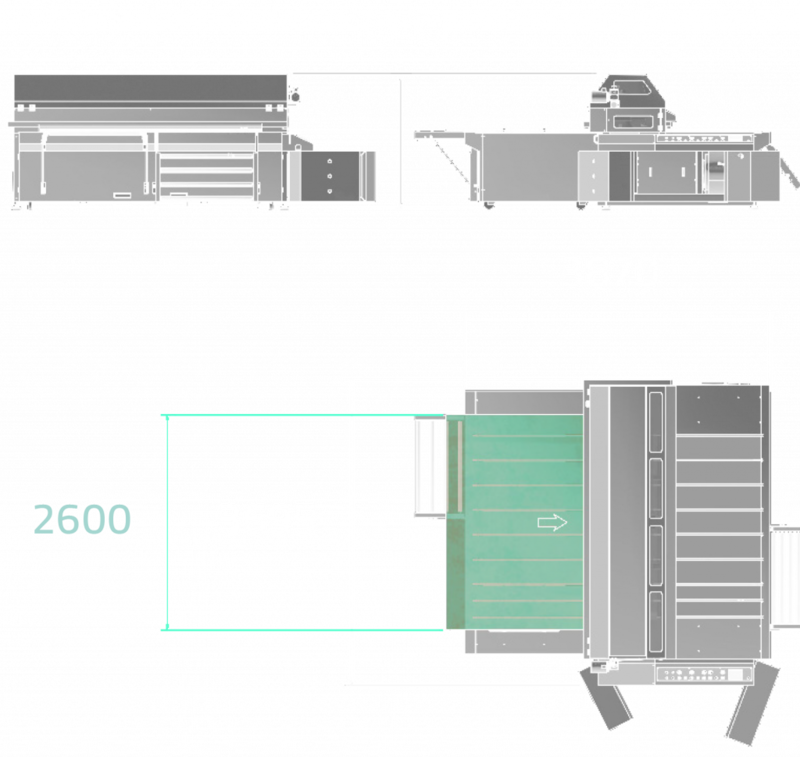 Colour change is unfeasible for small and medium series, so roll painting lines can only be used for large series. The Picasso can run a new colour even for just a few glasses. Roll painting lines require adjustments each time the glass thickness is changed, while the Picasso needs no tuning for this. Roller systems take around 80μ to 90μ to get a good finish while the Picasso requires between 35μ to 40μ for getting the perfect finish. 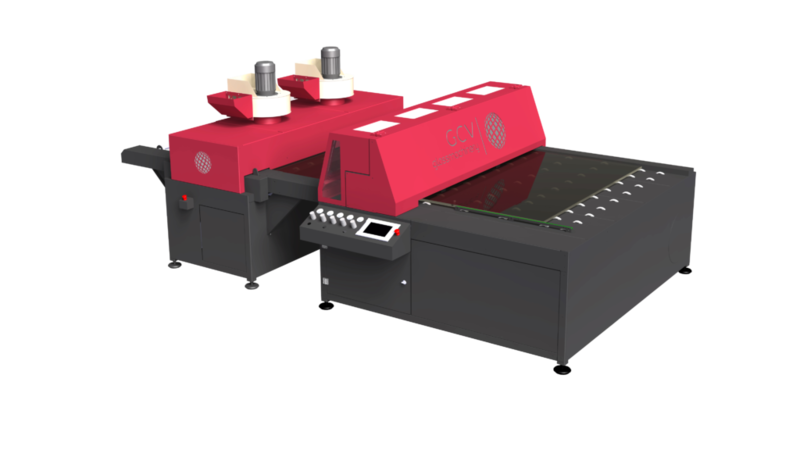 I have got a serigraphy machine already, why should I need a Picasso? Serigraphy is not competitive for full painting and the mask must be covered at the glass size so that the paint does not stain the table. Picasso paints any size by measuring automatically. Changing colour requires mask cleaning, while the Picasso runs this in 3 minutes. Masks cost and cleaning time are two important drawbacks too. Picasso sprays any product getting perfect finish at less coat thickness.